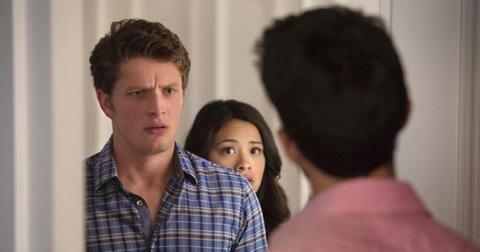 Last season, Jane the Virgin unleashed the ultimate bombshell when Michael reappeared after "dying" in Season 3. And in typical telenovela style, his return came at the worst possible time for Jane, who was moving in with Rafael — who was also ready to pop the question to the aspiring writer. However, in a plot twist that no one saw coming, instead of a proposal, Jane is surprised with the arrival of her thought-dead husband Michael. Seriously, WTF. Now, fans are divided between #TeamMichael and #TeamRafael as the fifth and final season of the CW series comes to an end. So, will Jane end up with Rafael or Michael? In case you need a recap, the reasons behind Michael's disappearance was simple: a case of amnesia. During the Season 5 premiere, it was revealed that Michael's memory was wiped by Rose — aka Sin Rostro, the drug lord Michael has been hunting since Season 2 — and he awoke in the middle of a field in Montana. He is now a rancher and goes by the name Jason. NBD. "Amnesia was the thing that first entered us into that space with Rogelio’s telenovela, and so once we knew Michael/Jason was coming back, amnesia felt like the right move in terms of just how to create so much drama for the finale season — and also the emotional toll of how someone you love looks at you like a stranger felt very exciting but also challenging, in terms of how to ground that," showrunner Jennie Synder Urman told Variety. "It raises interesting questions about the soul and soulmates and what makes a person," she continued. "If we’re a collection of the stories we tell about ourselves, or if we’re actually what’s essentially there — and how experience molds us." As expected, fans are conflicted about exactly who Jane's "soulmate" really is. For some, the answer is obviously Michael, since Jane is still technically married to him. "With this being the final season I'm really hoping Michael remembers everything and they end up together (sorry Rafael) I'm hoping they continue to explore his memories and relive everything that has happened over the seasons and they get together again, maybe she's pregnant at the end and this time Michael is the father," one fan theorizes. "They've been through so much together. I just can't see this ending with her and Rafael forever. It will always be Michael and Jane." Others claim Jane and Rafael's relationship seems forced, while her love with Michael was pure. "I felt that Jane and Raf were forced. She didn’t think twice about 'that one time' until she was pregnant and found out who the father was. THAT was when Raf came back into her life...he did not seek her out, nor did she him," a viewer wrote on reddit. "Michael always seemed to seek Jane out and pursue her. Maybe I just like the way my husband sought me out, and that is why I am more drawn to Jane and Michael, vs. Jane and Raf. Raf kind of felt like he just filled a space, but Michael clicked into that space... Also, the way that Michael took the time to learn his vows in Spanish?!" However, for others, Jane has no choice but to pick with Rafael seeing as Michael is no longer the same person. "Rafael is heartbroken, but lets her because he knows it’s what’s best for her. Once she realizes that she doesn’t have the same feelings for [Micheal], she tells him about how she loves Raf and was going to marry him. She goes back to Rafael, one of them proposes after a few days, the other says yes," one redditor predicts. "Of course, I’m hoping the series ends with a jafael wedding and Michael watches, feeling melancholic but overall happy for Jane as he knows it’s what is best and he has moved on." Another agreed, adding, "I feel like Jane will want to try to honor their marriage but they'll both acknowledge that too much has changed and Jafael will continue as planned. I know a lot of people are not looking forward to a Jafael ending but for me I feel like Jane already had a [happily ever after] with Michael and it would be really boring if she just picks him again." Are you Team Michael or Team Raf? 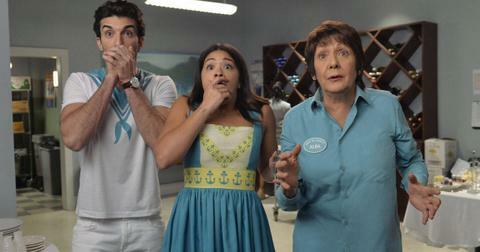 Watch Jane the Virgin on Wednesdays at 9 p.m. on CW.